Monocyte. 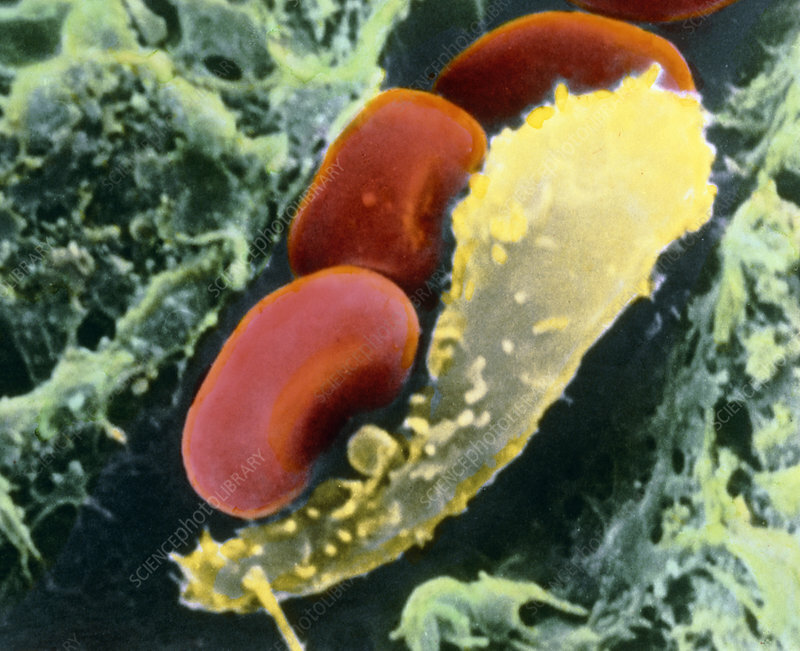 Coloured Scanning Electron Micrograph (SEM) of a human monocyte with red blood cells, in the lumen of a small blood vessel. The monocyte (yellow) is the largest type of white blood cell. It has little function in blood, but by being mobile it migrates into tissues where it is known as a histiocyte or macrophage. As seen here, it has protruberances on the cell surface which helps it to move. In tissues it scavenges and engulfs cellular debris and foreign micro-organisms. As a macrophage, a monocyte thus plays an important role in the initial phase of the body's immune response. Magnification: x3,800 at 6x7cm size.